It was lovely to welcome students from my introduction to hand-dyeing workshop back to Black Sheep Wools for a day of advanced hand-dyeing! This one day course builds on the skills learned on the introductory course and we explore new ideas and techniques. One of the main aims is to encourage students to create colour in a more structured way, producing their own colourways and developing their colour blending skills. 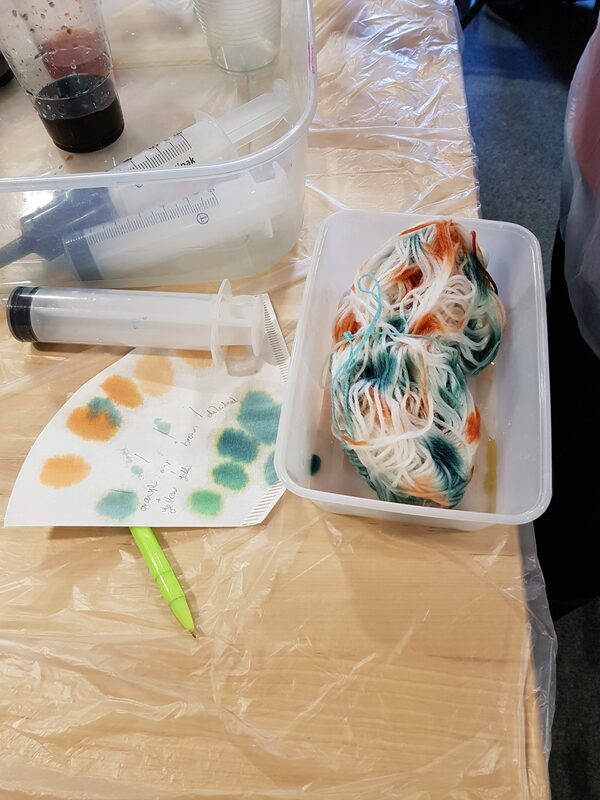 To get things off to a relaxed, fun start, we began the day with ball dyeing using our beautifully soft 4ply wool/nylon yarn, perfect for socks, shawls and light garments. We went on to create designer colourways, blending dyes to produce unique, one of a kind skeins. There were so many lovely combinations, here is just a selection!